Note: Windows SmartScreen protection may display a warning when you run the program. You need to click on the “more info” link and then on the next screen on “run anyway” to install the program. Note 2: The program ships with third-party offers. Make sure you decline those if you are not interested. Note 3: The program page is in German, the program itself is in English and German. Just click on the download link on the page to proceed. Once you start the program you get a list of tweaks that it supports in an easy to use interface and a prompt about creating a new system restore point. It is recommended to set one as it allows you to go back should things go wrong. Each entry is listed with its name and state (a checkmark indicates that the feature is disabled), and a description on the right when you highlight it. If you are in a hurry you may use the check all button to check all items but that is not recommended as you may disable features of the operating system that you want to use. The program seems to have issues detecting the current state of a feature. On the Windows 10 machine I ran it on, Web Search was already disabled but the program did not indicate that. The app makes the changes in the Registry in the background. Please note that you may need to restart the system before they take affect. 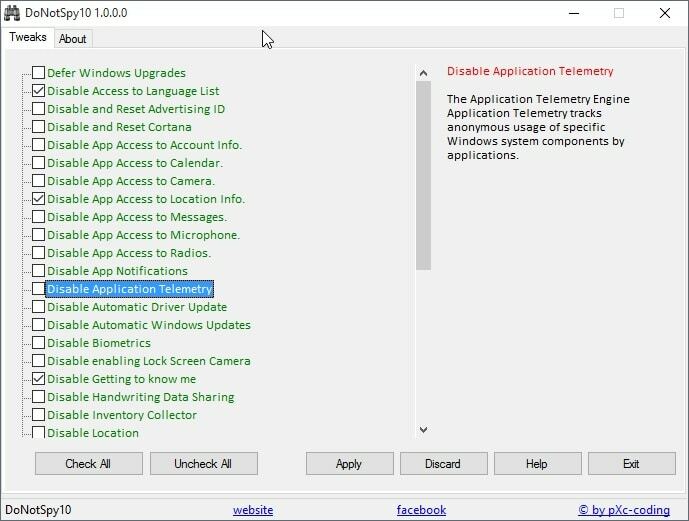 Once you have restarted the PC you will notice that the changes have been made, for instance by opening Settings > Privacy where you find many of the options the program supports listed. The main advantage that DoNotSpy offers is convenience. Instead of having to hunt down the locations to change these settings by yourself, you find most privacy related settings in the program interface. This entry was posted on Wednesday, August 5th, 2015 at 10:04 am	and is filed under tech tips. You can follow any responses to this entry through the RSS 2.0 feed. Both comments and pings are currently closed.